111 W. Wacker, also known simply as OneEleven, is a towering residential high-rise that’s home to some of downtown Chicago’s most spectacular apartment residences. As part of The Loop, perhaps the best part about calling 111 W. Wacker home outside of the upscale living spaces and lavish lifestyle amenities has to be living just steps from so many downtown Chicago attractions, including the downtown theater district, Chicago’s primary business and financial core, the downtown River Walk, and countless shopping, dining, and entertainment destinations. But speaking of lifestyle amenities, there certainly isn't a shortage over at OneEleven, as the building features just some of the following: 24 hour door service, five-star management, on-site parking, the Club OneEleven Lounge, a beautiful indoor swimming pool, a sprawling outdoor sundeck, and a state of the art fitness center. 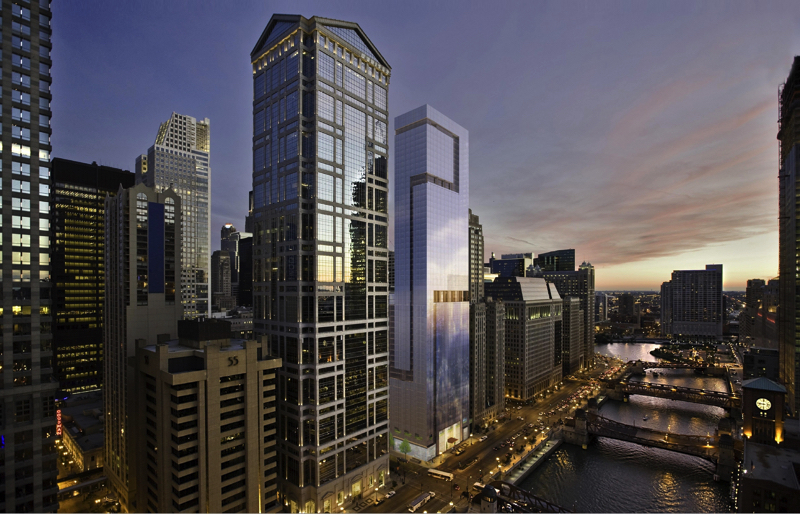 Check out 111 W. Wacker rentals or learn more about the building below. 111 W. Wacker was originally designed by architect Gary Handel of Handel Architects while the building’s interior was designed by Kara Mann of Kara Mann Design. Standing 60 stories high and topping out at 630 feet, 111 W. Wacker houses 504 units in all, not to mention a parking garage that includes 470 parking spaces, approximately 30,000 square feet of amenity space, and roughy 32,000 square feet of retail space on the ground level. In addition, the building’s location at Lasalle and Clark Street provides residents with spectacular, unobstructed views of the Chicago River, which only compliments the already strong sense of appeal and desirability that relates to living at Chicago's one-and-only 111 W. Wacker. DIDN'T SEE ANYTHING YOU LIKE 111 W. WACKER? If you're finished browsing apartments for rent at 111 W. Wacker, start searching other luxury rentals in Chicago or contact The Guarnero Group at 844-SEE-CHICAGO for help with your Chicago home search!